I've been saying from the get-go that TAGAP 3 has quite a huge and colourful cast of characters, but we haven't introduced any of them yet. Well, that changes today, as here's the first of the new principal characters; Paola the Funky Companion! Working undercover in the ranks of PDOH (Pluto Department of Health) as The Nurse, Paola is actually one of the leading members of Pluto's revolutionaries opposing the war against Earth. As she sees Pablo as the key in stopping the war before it begins proper, Paola risks her cover by assisting in Pablo's jailbreak. And so the adventure – and the friendship of our lead heroes – begins. As a character, Paola is a jack-of-all-trades not too different from Pablo. Being one of the figureheads of a planet-wide revolution isn't an easy task, but she pulls it off in strides. After being discovered and branded as part of PDOR (Pluto Department of Revolution), she adapts a new title of The Companion and becomes, in an essence, Pablo's new sidekick. In terms of design, I really took my time with Paola. 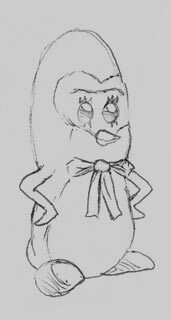 The main thing I wanted to achieve with her design was to create a cartoon girl penguin without resorting to using a feminine hourglass figure. 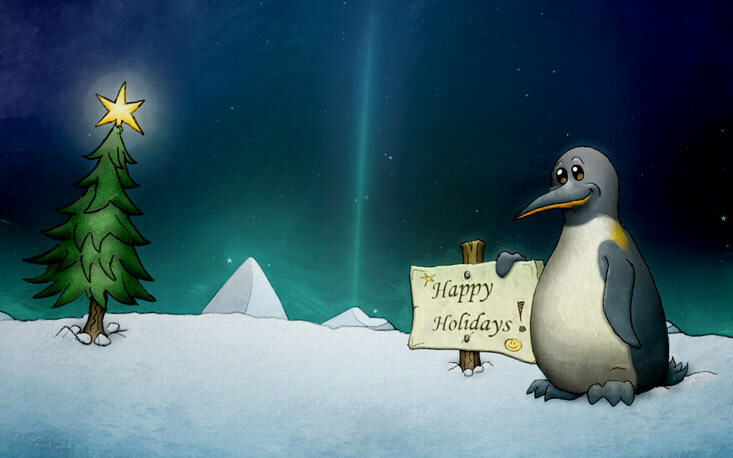 Seriously, that pisses me off endlessly with Hollywood's penguin animations – even the otherwise-perfect Happy Feet resorts to it! So, instead of turning the girl penguins into mutants with mammalian characteristics, I decided to make the differences as subtle as possible; She has visible eyelashes, her features are slightly more fit and the details like eyebrows and muscles are less accentuated. Additionally, her tie is slightly more feminine variant of the basic ties and bowties the males wear. And no, the pink tie has nothing to do with her being a girl; Everyone wears pink on Pluto! The way I designed Paola became the basis for the rest of the female penguins in the game. And there are plenty; Almost every standard enemy has both a male and a female variant – both of which have slightly randomized features for even more variety. As you may have noticed from the above description and the two wallpapers we've released so far, departmental codes play a big part on Pluto of TAGAP 3. You see, Pluto's society is split into a handful of big departments, each led by a department leader – all of whom share the ultimate leadership. That is, of course, until a specific kind of emergency rises, raising the related department to the leading position. And that is basically what happened when Pluto declared war on Earth; It's war, which goes under the mandate of PDOD (Pluto Department of Defence), making the Funky Warlord the leader of the entire planet, with all the other departments contributing to the war effort. In fact, under the state of war the departmentalization has been accentuated to the point that most Pluto citizens don't even go by their names any more, but by their official designations. PDOR, or Pluto Department of Revolution, is an outlawed department that consists of the revolutionary movement of Pluto. While PDOR originally was a peaceful protest movement opposing the idea of declaring the war against Earth, by the events of TAGAP 3 it has turned into a full-fledged rebel movement. They actively seek ways to dismantle the leadership now almost exclusively held by the Warlord of PDOD and to restore the lost individuality of the citizens. While the official departments, especially PDOD, view the PDOR as a group of terrorists, in actuality they haven't participated in terrorism. In fact, most of their work has been activism, hacktivism and intelligence activities. However, the eve of the war only days away and the Pluto's internal crisis about to hit the tipping point, the situation is heating up and a call to arms seems inevitable. And of course our heroes are in the middle of it all. Here we give you a glimpse of another of the main characters, this time an antagonist. 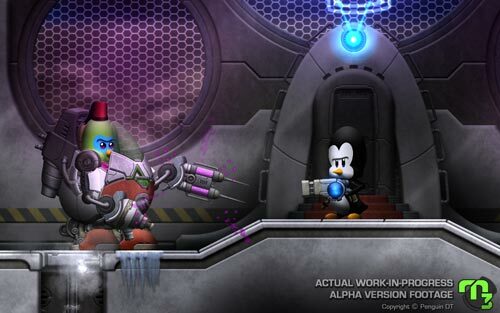 But not just any antagonist, but the very first boss you'll encounter – donning a penguin-fit power armour! An the bird in the controls? Well, his full profile will be revealed next year, so stay tuned! And what would a blog update from our dungeons be without the usual update? Right now I'm, still, working on the introduction animation for the first boss fight. This is, from tech perspective, one of the most complex cinematics in the game and for that reason it has taken me a week already. One could argue that I should rewrite the sequence as something simpler in order to save time, but I really can't. You see, as I've explained earlier, the level I worked on before – the special level with all custom assets – leads into the first boss fight. And that level is such high-concept sci-fi that in order to sell the idea, I have to absolutely nail the transitions to and from the level. That means cutting corners in this case is a no-no, even when it means I've had to recode parts of our physics engine in order to achieve what I want. Additionally I've had to establish the way we'll introduce the bosses and scripting that for the first time has been a case of trial and error. But hey, if this sequence becomes even half as great as I predict, it'll be once of the best non-interactive sequences I've created in the TAGAP engine so far. Well, at least until we get closer to TAGAP 3's finale, of course!